(P. & D. Colnaghi, London, by 1958); Joseph F. McCrindle [1923-2008], New York, 1958; bequest to NGA, 2008. Drawing: Techniques and Types. The William Benton Museum of Art, The University of Connecticut, Storrs, CT, 1975, no. A 14. 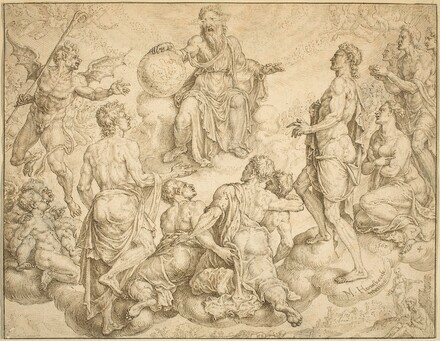 Old Master Drawings from the Collection of Joseph F. McCrindle. The Art Museum, Princeton University, Princeton, New Jersey, 1991, no. 73 (cat. by Frederick A. den Broeder). The McCrindle Gift: A Distinguished Collection of Drawings and Watercolors. National Gallery of Art, Washington, 2012, 28-29, no. 3 (entry by Rozemarijn Landsman). Veldman, Ilja M., compiler. The New Hollstein. Dutch & Flemish Etchings, Engravings, and Woodcuts 1450-1700. Maarten van Heemskerck. Edited by Ger Luitjen. 2 parts. Roosendaal, 1993-1994: pt. 1, 140 (under no. 164). Harris, Ann Sutherland. Review of Frederick A. den Broeder. Old Master Drawings from the Collection of Joseph F. McCrindle. Master Drawings 32, no. 1 (Spring 1994): 68.